Note: This is a guest post from Lygeia Ricciardi ( @Lygeia ). 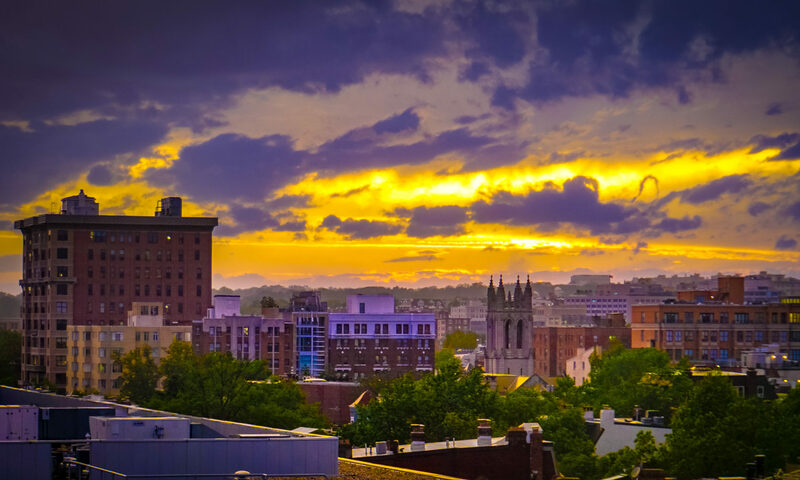 Ted and I have had the pleasure of collaborating for some time through the Clinovations collaborative here in DC, and we share a lot of the same interest and passion around putting consumers/patients/citizens at the epicenter of health care change. 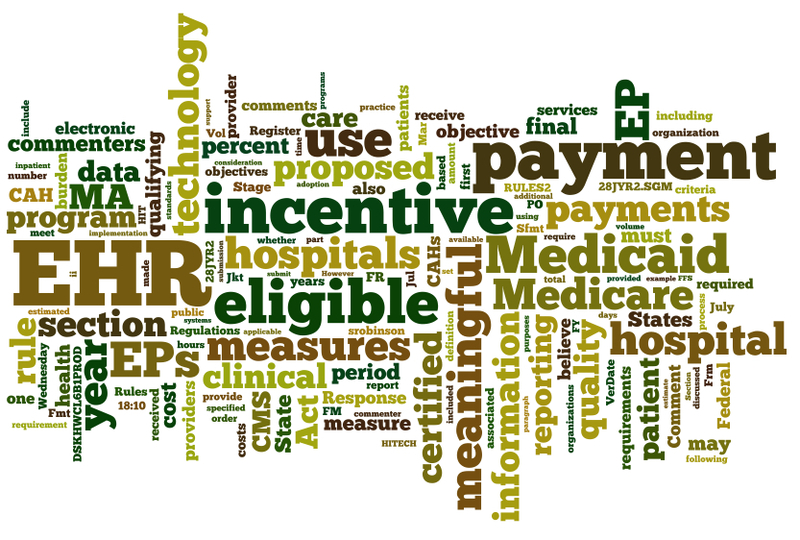 I made this “wordle” from the text of the Meaningful Use final rule as printed in the Federal Register July 28, 2010. Note that I didn’t include the text in tables, because it didn’t transfer easily into the wordle program… but I did get the rest of the 273 pages. After I did it I searched to see if anyone else had done something similar. Indeed I saw that David Harlow at HealthBlawg made a wordle of the proposed (as opposed to final) Meaningful Use Rules back in January–it looks pretty similar. 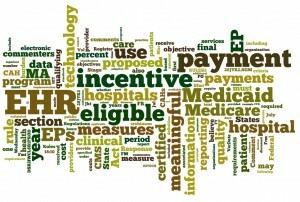 The Meaningful Use Rule spells out the details for how eligible hospitals and health care providers can qualify for incentives to use electronic health records (EHRs). Up to $27 billion is available—an amount that far dwarfs any other public investment in health IT in the US to date. The idea behind the Rule is to encourage the use of technology in ways that genuinely improve health, not just to acquire tools for the sake of having them. Well, not surprisingly “EHR,” “incentive,” and “payment” feature prominently. As do Medicaid and Medicare (the incentives are only for providers who treat patients via those programs). It’s worth noting that the word “patient” is a bit harder to find – there it is in green on the bottom right. One of the most important challenges in implementing Meaningful Use, in my opinion, will be finding ways to make it meaningful for patients. What do you think? Eye opening post. Sad that patient is such a sideline. Shouldn't it really be ALL about providing better care? True hospitals/physicians are businesses but that business ultimately revolves around the care of the patient. When I attended the Meaningful Use Summit at Cerner, I noticed the same problem in their wordle on the cover of the summit agenda. I pointed out that the word patient was far too small…. So I designed Roni's jacket and created a wordle that should be…. 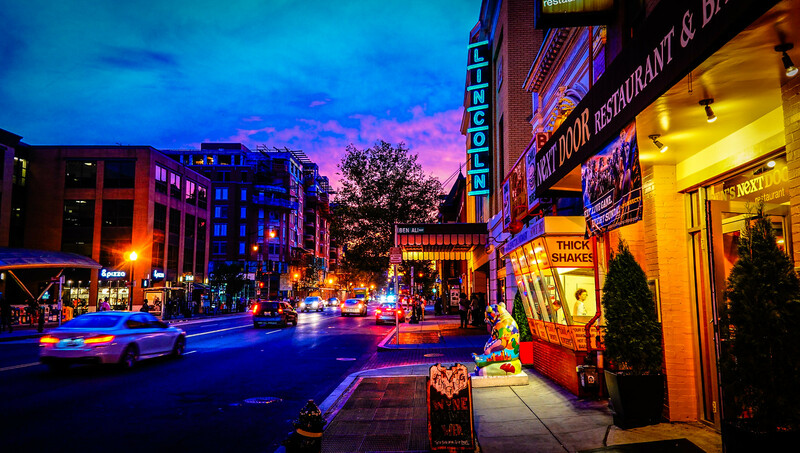 Great post Lygeia! I always love to read your work. Thanks Steve, Robert, Dan, and Regina — and I really like Regina's "wordle that should be." This discussion is the tip of the ice burg of a discussion about how to measure our progress as we evolve our health system — I hope — to be more patient-centric in general. It's a reminder that choosing to measure something helps to focus our attention on it. Previous PostPrevious Now Reading: A 73-cents-like call to action in “Equity and Excellence: Liberating the NHS”?